A crackdown on excessive debt. Financial engineering gets more expensive. Starting in 2018, a company can only deduct interest expense of up to 30% of its Ebitda (earnings before interest, taxes, depreciation, and amortization). Any amount in interest expense beyond it will no longer be deductible. This will tighten further in 2022, when the deductibility of corporate debt will be capped at 30% of earnings before interest and taxes but after depreciation and amortization expenses. This is a much smaller number than Ebitda. And interest expense deduction is capped at 30% of that much smaller amount. This will raise the tax bill further. Most impacted will be highly indebted companies, which often have a junk credit rating. And due to this junk credit rating, they also pay higher interest rates. This made the interest expense deduction very valuable. But now it is getting partially gutted. 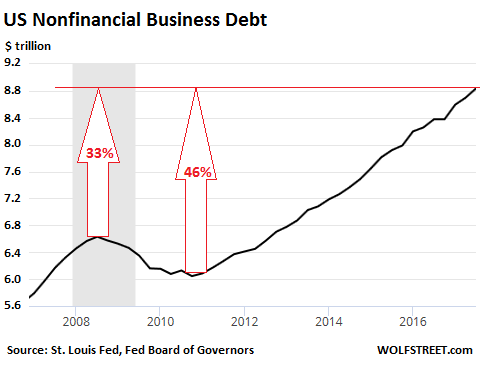 Businesses have long been incentivized to borrow, not only by the extraordinarily low interest rates even for junk-rated companies, but also by the full deductibility of interest expense. And thus encouraged by the tax code, corporate debt has surged. Mergers & acquisitions, share buybacks, leveraged buyouts, and dividends have often been funded at least partially with debt. And over the years, companies have piled on an enormous amount of debt. According to estimates by the Congressional Joint Committee on Taxation, cited by The Wall Street Journal, the first phase of curtailing interest-expense deductibility – the phase that kicks in next year – would raise $171 billion in tax revenues over 10 years. The second phase that commences in 2022 would raise $307 billion over 10 years. This would be the billions of dollars that highly indebted companies would pay more in taxes because they’re losing the deductible of some of their interest expenses. It will be a significant hit to their after-tax income. It won’t kill them, but it will lower the incentive to borrow. It only impacts companies with a taxable profit and won’t hit companies that are already money-losing shipwrecks because they have no income and pay no income taxes. And for companies with less leverage, the benefits enshrined in the new tax law far outweigh the additional tax expenses associated with the new limits on deductibility of interest expense. But it will hit companies that are loaded up with debt. These are already precarious constructs, and any major additional expense makes them even more precarious. Private equity firms have long specialized in leveraged buyouts (LBOs) where they buy a company mostly with funds that the acquired company has to borrow and carry. If all goes well, the PE firms are able to unload the company via an IPO, but much of the debt from the LBO remains. For example, First Data Corp. It was acquired during the LBO boom in 2007 for $29 billion by KKR. In October 2015, KKR started unloading it via an IPO. As of its third-quarter filings, First Data still has $18.5 billion in debt, which is junk-rated and generated $964 million in interest expense over the past four quarters. But going forward, the interest expense deduction would be capped at 30% of Ebitda, which was $2.7 billion over the past four quarters. In other words, its interest expense deduction would be limited to $810 million. The remainder, $154 million for the 12-month period, would be a hit to its net income. “We will need time to fully understand all aspects of the bill and its impacts on our financials,” a First Data spokeswoman told The Journal. Some highly leveraged companies have already warned about this in their earnings calls, many others will. The most leveraged, M&A-prone, and LBO-infested sectors would feel this the most, including technology and healthcare. But all profitable companies with significant debt levels will feel it. The new tax law has an additional provision that will lower the value of the interest expense deduction further: the 21% maximum tax rate. Under the old law, 35% of the interest expense would essentially be covered by the government. Under the new law, only 21% would be covered. These two provisions – the limits on deductibility of interest expense and the lower tax rate – remove much of the tax incentives to borrow. While companies will — and should — continue to borrow for revenue-generating purposes, and while they’ll love the new 21% tax rate, the hit to earnings from debt will be larger. This changes the equation for debt-funded financial engineering, such as share buybacks and acquisitions. To boost their net income, companies might curtail their borrowing binge for these unproductive purposes, and some companies might even try to deleverage in order to cut costs. Edging away, if ever so slightly, from debt-funded financial engineering projects would be a good thing for Corporate America and the economy overall, though it might be a mixed blessing for the short-termism and financial gamesmanship of Wall Street. This adds to the context of the new tax law as a measure that attempts to pull the private sector away from the debt precipice by removing some of the incentives to borrow. This includes households. Under the new tax law, they’re losing some of the incentives to binge on debt-funded home purchases. And the magnitude of this change has not been fully appreciated just yet. Read… What Will the Tax Bill Do to the Housing Market? Be interesting to know who was behind this set of moves (somebody actually had their heads screwed on ) and how much deleveraging it causes going Forward. I guess the authors of the tax reform realize how dangerous non-stop borrowing has become. I wonder what happens to the debt-loaded shale drillers? After all, shale drilling is all about financial engineering. Ahhh .. you do realize that the authors of this so called ‘ tax reform ‘ just plunged us into an additional $1.5 trillion in debt over the next ten years over and above what was already projected .. don’t you ! It has the potential to begin a deflationary crash, the rate hike policy is mild pushback against the energy surplus high yield formula. The collateral damage of raising rates will cause a panic reversal, then we see who is swimming naked. The whole country is swimming naked. Heck, the entire world is swimming naked. If you are not, then once people know the fact, they’ll strip you naked anyways. The authors of the tax bill are corporate lawyers who work at lobbying firms. Lobbyists have been assigned the task of writing our laws and any congressman who doesn’t play along will have his usual slush fund of reelection money given to an opposing candidate instead. Congressmen can’t even be bothered to read all the legalize they vote on – they have admitted as much. The lobbyist are like a bunch of hyenas fighting over the dead carcass of a once free country. All that matters is each special interest receives the special treatment they pay for. Everyone takes and takes and assumes they will be dead or wealthy enough to move on to greener pastures before it all crumbles to the ground. Everyone can’t be correct. Its not spot on its only half way up the Tree. The Flawed US Constitution that enshrine the Duopoly they own, with 2 Senators for each state. In the old world That was fine in the modern world of near instant communication and money transfer. It does EXACTLY what it was intended to prevent, it ensures the dominance of 1 group. Constitutions are supposed to be l;ike Language live moiving withthe Times. And the DOG is stupid enough to cry, instead of doing something about it. EXACTLY what the founders DID NOT want. This will kill a lot of zombies companies, right? It really depends on your definition of “zombie company”. A company loaded with debt which has no taxable profit would not be affected by this reform plan because, well, they pay no income tax to begin with. But a company that depends on taking on ever-increasing amounts of debt to turn a profit, for example by going on crazy acquisition spreads, would be hit the hardest, especially after the EBITDA grace period is over. This rule would also affect companies, especially profitable ones, that finance share buybacks through debt: they will have to carefully weigh the pro’s and con’s as goosing dividends by reducing share numbers may end up costing them millions a year in extra taxes. I hope this cleared it up for you. that would have to hurt them dramatically.. This is one small step in the right direction. Only one small step to save the American way!! I was always under the impression that if your business didn’t make a profit within 5 years it was then considered a hobby and you could no longer take any deductions for that entity? How do these zombies companies keep losing so much and stay as a business or is this just a sole propriety thing? Look at Tesla. It has lost a ton of money every single year of its ten years in existence. And the losses are growing. As long as investors keep feeding it with money that it can burn, it will go on just fine. However, Tesla doesn’t pay income taxes because it doesn’t have any income. A company will go out of business if it runs out of money. The IRS phenomenon you’re talking about is limited to Schedule C business deductions (sole proprietorship) on your federal tax return for individuals. Isn’t it a fool that feeds Tesla lookalikes with money to burn ? Or is it money being fed into the sausage machine, to come out at a designated point, as profit for vested interests, a third party ? It’s not just corporations that might get squeezed. Deductions for home mortgage interest and non-federal taxes are also newly limited. This will hit me but I am very much in favor of it. In NJ, our local governments have huge taxes which people don’t complain about it much because they get to deduct it from federal so it’s really 30% less. A lot of people misunderstand and think it’s actually 100% so not really costing them anything. Prepare for your property tax to go up, if New Jersey is smart at all in the way it writes tax policy. Personally, I am not wild about Congress picking favorites in among state tax policies. I understand why they did it, which doesn’t make it any more attractive. Interesting observation, and quite correct. Of course, this won’t matter to a paper flipping stock buyback maniac. Somebody else is paying the bill regardless, as always. Free money to the executive at any interest rate. Pardon my cynicism, but I believe most buybacks were predominantly executive compensation schemes with only secondary concern, if that much, for ‘investors’. But capital budgeting decisions where the NPV and IRR take tax rates into consideration will be affected, assuming such job creating investment returns to the business world as rates rise and free money diminishes. On first glance, one would expect more stock issues and fewer debt issues to raise capital down the road. Many of the larger Airlines are loaded with debt too. Which isn’t necessarily a bad thing if the aircraft being financed generate revenue. American has a very high debt load for instance and like I said, that’s not entirely bad. What’s concerning to me is the impact going forward on sound business models built on sound principles of debt management who may find themselves in a bad position as a result of a rules change. Financial repression, leading to dirt cheap debt servicing, is one of the chief factors which led to the budget airline boom in Europe, even more so than deregulation. For every Ryanair or Wizz Air doing very well there are many airlines flirting monthly with bankruptcy. Sometimes even historically low interest rates aren’t enough to keep airlines in business. To quote but a few large ones this year saw Monarch, Niki and Air Berlin going out of business. Alitalia filed for bankruptcy protection for the third time in under a decade and would have been long liquidated if not for politics. Looking at the immense order books Airbus and Boeing have accumulated for the new generations of their main breadwinners, the A320neo (5,254) and the 737MAX (4,065), it’s hard not to wonder if those order books would be so large if not-so-financially-sound airlines would have to pay anywhere near interests reflecting their situation. This distortion has led to a paradoxical situation: markets are saturated with used airliners with still acceptable “running costs” and plenty of hours left in their airframes. A part of these aircraft find new homes and are put into revenue passenger service right away, some others are converted into freighters (if you drive by the Basel-Mulhouse airport you’ll see the rows of 757’s and 767’s being converted into cargo airplanes for carriers such as DHL) but the others get “mothballed”, waiting for a buyer or, more often, the demolition crew. Europe hasn’t true “aircraft graveyards” such as the Mojave Air and Space Port or the Alice Airport, so we are basically piling aircraft around wherever there’s room. The Teruel and Pau airports, traditional graveyards, are filled to the gills already, including the first Airbus A380’s to be retired (the new A350 makes them effectively reduntant, especially in the stretched -1000 version), so we are parking aircraft wherever there’s a runway long enough and enough cheap room, such as in the not exactly important Perpignan airport. I hope, the A380 isn’t being scrapped, only refurbished for another purpose. Since none of them is older than ten years, it would imply that Airbus would have to write off the whole project. After an A400 write-off, how could it possibly survive? Amazingly, the new plane order mania didn’t disappear despite record low fuel prices. I guess, it has to do with money printing, and as a consequence a whole generation not knowing what a real recession feels like. Malaysian Airlines (MAS) has already retired all their A380’s and passed them to another State-owned company which is allegedly having them converted to a single class configuration to use in religious pilgrimages. This means these aircraft will sit unused outside the Hajj and Umrah seasons, but it’s better than the first option, which was having them scrapped. These airframes have a lot of flight hours left in them and if fuel prices remain reasonable and turbofans don’t get through some other revolutionary breakthrough they may still be flying in the 2040’s, if only used for pilgrimages. MAS is replacing the A380 with the A350, and so is Singapore Airlines: the A380’s they leased from Dr Peters, a German leasing company, are being returned as we speak and mothballed in Pau. Dr Peters leans towards having the aircraft scrapped as there’s no aftermarket for them: the A350 and, to a lesser extent, the 777X are cannibalizing the A380. Airbus has had no new orders for the A380 in 2015, 2016 and 2017 while they are being flooded with orders for the A350. As we previously discussed, it’s extremely unlikely the A380 would have even got off the ground had it not been for Emirates’ absolutely insane orders (142 out of 317). The aircraft is engineering marvel but it struggles to find a niche outside of Emirates’ business model and is clearly suffering from an environment which favors twinjets. And if Athens weeps, Sparta isn’t laughing: the Boeing 747-8 is a disaster. Like the A380 it is an engineering marvel: it’s fast, quiet, with long legs and comfortable. And just like the A380 its sales prospects are being slaughtered by the new generation of twinjets. Boeing did not expect to sell those many passenger versions, but freighter orders have languished as well, squeezed between the success of the 777F and the ready availability of 747-400’s with low frame hours for conversions. As Tom Enders (Airbus CEO) said, he has to bear two crosses: the worse is the A400M, a disaster on which Enders has spared no vitriolic words and the other is the A380, which suffers from a rapidly changed environment and overdependence on a single customer. When an Aircraft manufacturer, can not successfully build a 4 Engine, turbo prop, Military Transport, in this day and age. It should simply admit the truth. That as an Aircraft manufacturer, it is a state subsidized disaster. Then get out of the aviation business. I guess, there is some justification for the A380; Airbus could not leave the space, and monopoly pricing power all to Boeing. Tied to it is the monopolization of the airline industry. And last but not least, this project would not have taken off without political support, and the hubris of Europe the Great at the time. It is a valuable and relatively cheap lesson of the bonfire of the vanities. Enders has clearly pointed to the causes of the A400M disaster: first the total confusion reigning over engine choice and later the “immense political pressures” by European governments for the choice of contractors, contractors which often had absolutely no experience in such a complex engineering project. Airbus was left trying to piece together a viable transport aircraft, knowing fully well it would be mediocre at best: that’s the price to pay for the large orders Airbus regularly receives from partially State-owned airlines such Air France and the large scale diplomatic efforts going into convincing Middle Eastern and Asian carriers to buy Airbus over Boeing. This really will change the way a lot of businesses plan their future. I was wondering how a business like Tesla would ever be able to actually become a profitable business with these policies in place. Maybe it is just my lack of understanding but seems that once a business starts out with lots of debt, which a lot of start ups do, that once they actually make a profit so to speak, wouldn’t their tax burden take up a lot of that profit.. Isn’t this going to make PE and even to a lesser extent VC businesses less viable? It would seem that the tax changes should have treated borrowing for infrastructure, tools and equipment differently than stock buy backs and other gimmicks to enhance executive compensation.. Interesting article once more, Wolf. This might be a monkey wrench in the wheels of schemes based on PE 101, because the shell companies loaded to the gills with debt by their PE overlords will find it harder to handle their debt load due to reduced deductability. Once more it also points out the fact that the tax package will have interesting effects during the reign of next congress to deal with. Tho I am not seriously suggesting it’s related, I do find it interesting that the u.s. has taken a step that will seemingly reduce the supply of corporate debt offerings in advance of the need for increased demand for treasuries generated by continued, and increased, deficit spending and the fed’s roll offs. Seening something like this acctually makes me feel better that at least some of the bills architects had a nobel proposes in mind and acctually wanted reform. Detaching tax breaks from debt is probably a good thing even if it may be painful in some cases. Especially if they are implementing such changes accross the board. In a world where incomes, both personal and corporate, were declining or flat-lining, debt was the only solution to bridge the gap. This new Tax plan is a textbook solution to bringing investment, jobs and incomes back to the U.S. Making income/profits more attractive than borrowing, in theory, is the incentive to work more, produce more, think more. Let’s see what the next 10 years brings. Look, this new tax plan is based on the trickle-down fairy tale. It has never worked and it will never work. Companies are not holding back investment because they lack the funds, on the contrary, they sit on record profits and can borrow at low interest rates. No, companies will never invest if there is no additional demand to meet. That is why supply side economics is simply plain BS. With this tax plan, the wealthy will have even more money while the middle class will be further screwed (seeing how their disposable income disappears). So, as a result, job losses will follow. Do you know what will companies with their extra funds? You name it: dividends, stock buy backs and big big fat bonuses. Banks, who are largely out of residential mortgage business since 2008, have been lending or facilitating lending (bond issuance) to corporations instead. Corporate debt has ballooned from 3.4T to 6.1T from 2008 to 2017 ( https://fred.stlouisfed.org/series/NCBDBIQ027S ). Banks have tons of excess reserves to play with, because of QE. Now the banks want to drive the corporations bankrupt so that said banks can take over the corporations by offering to convert the debt into equity to recapitalize the corporations, while existing shareholder essentially get wiped out. End result: Bankers own corporate America, which is what they always have wanted. I think this kind of bank scheme used to be common until the Glass-Steagall act was passed in 1937, which essentially forbade banks from owning other corporations (investment banks) which in turn could own shares in any corporation. Since the Glass-Steagall repeal in 1999, predatory bank lending to corporations has become a viable business model again, even after the 2010 Dodd-Frank act, I think. Can anyone think of another logical reason why some special interest group would like to limit interest expense deductibility for corporations? Good observation. And, as to your ending question – please see Art’s excellent observation as well. It could be two birds with one stone. Create more demand for Treasuries (to fund the ongoing deficits) AND bankers looting Corporate America. Time for everyone else to turn on, tune in and drop out…. Debt is a bigger problem for lower income businesses and consumers, so consider this bill will die an early death. The notion that companies with revenues will be losing the deduction in ten years, and paying more in taxes (while their tax lawyers just sit there and do nothing about it) is absurd. They put the same tax plan forward in BushII which ended in 2008. Airlines is always a doomed business, hence why a lot of them used to be state owned. Private airlines basically stay alive by… well I have no idea. Anyone knows? I mean considering the huge debts they have and all. Airlines speculate in fuel options. Sometimes they win really big and make a profit larger than any operating profit could be. Sometimes they take losses too. Check the source of their income and losses. Ryanair, Wizz Air and several cargo airlines such Nippon Cargo Airlines and Kalitta Air are doing rather well for themselves. Granted, they know how to milk the system, but if local governments build useless airports and then have to lower themselves to humiliating conditions to keep them open you cannot blame the airlines. Same thing about the aircraft they buy: Airbus and Boeing have the discrete backing of several governments. Just to give an example one of Boeing’s chief contractors, Leonardo of Italy, sells components to them at cost or even at a loss because they need to keep unprofitable factories open for political (read: electoral) reasons. Needless to say Leonardo is effectively a SOE. If airlines can buy aircraft at discounted prices and get all sorts of incentives from local governments to use otherwise useless airports we cannot really blame them. I have seen it claimed that in total, using enterprise or “silo” accounting, civil aviation has never earned a dime, and has always operated at a net loss, exclusive of direct and indirect subsidies. Corporations will be subject to limits on interest expense deductions from income, as can be seen in the following paragraph from the 2017 TAX CUTS AND JOBS ACT. The limitations are severe, namely the sum of items A+B+C below. My guess is that for a typical incorporated landlord, A=0 B=notbig C=0. I’m not a tax lawyer, but it looks to me like the ability to deduct mortgage interest from income will be severely limited also for corporate landlords, and not just for regular homeowners. Most of the mega landlords buy homes with cash they borrow in the bond market. There are no mortgages they pay, it is all interest expense paid to the bond holders. It looks like they will be affected by this interest limitation. FYI, in the paper “The Games They Will Play” dated 12/18, available online at ssrn, a gaggle of tax professors and lawyers suggest that both the corporate interest deduction limitation and the 162m compensation deduction limit may largely be avoided via a subsidiary pass-through entity, unless that gets fixed later along with other glitches. A lobbyist and tax professional full-employment act. I can’t find the paper, link and some author names, please? Just as well there hasn’t been a 40-year program of closing factories and we have REAL engineering to fall back on for REAL wealth production isn’t it eh? To do a correct search, enclose the phrase “the games they will play” within double quote marks, not as single, stand alone words. Good article. One of the big problems of the modern financial world has been the excessive debt of corporations, not because of any kind of investment but simply to switch to a cheaper capital structure. The LBO booms forced otherwise healthy companies into way too much debt merely to fund the profits of the hedge fund buyers. At the same time, debt issued for share buybacks was a direct way to “benefit” from bringing more low-cost debt in the capital structure to “boost” equity returns with leverage. Though arguably too little too late, this change in incentives will at least push things in the right direction as stability and long-term planning is concerned. It sounds like debt used to fund buybacks and dividends will be discouraged while debt used to fund profit-making activities will be encouraged. Sounds like less financial engineering and more actual economic boosting to the real economy.